Welcome to TracfoneReviewer, with news, reviews and other information about Tracfone! A large screen at a budget price, the ZTE ZMAX Champ has a 5.5" touchscreen and can be found for just over $100. It also has a quad-core processor and runs Android 6.0.1 Marshmallow. 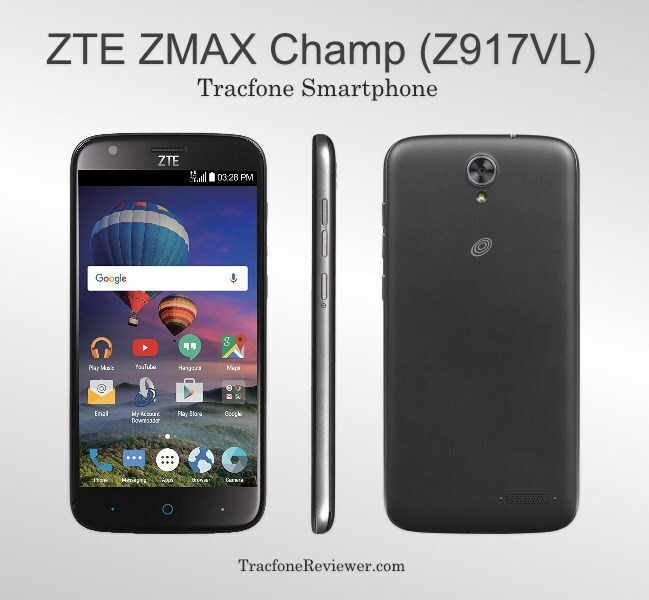 Find the full list of feature and specs listed below for the Champ, along with our review and how it compares to some of the other Android phones available from Tracfone. There are currently several smartphones available from Tracfone with 5.5" screens, which is becoming a popular choice for many. The LG Fiesta and Samsung Galaxy Sky Pro both have large screens like the ZMAX Champ, and we will be looking closer at how these phones compare. Tracfone continues to release new smartphones to use with their wireless prepaid network. You can keep up with the new devices in our List of Latest Tracfone Smartphones or simply visit our Cell Phone Reviews page where we include all the reviews we've done for Tracfone devices. The ZTE ZMAX Champ has some great features, but it also cut some corners to keep the price low. Here are the main pro's and con's for the Z917VL. A major downside for this device is the lack of internal storage, with just 8 GB. Uses may be able to use a Micro SD card as internal storage, but it is still a hassle to deal with a phone that is out of space. Below are the full features and specs for the ZMAX Champ. We recently reviewed the ZTE ZFIVE which shares many of the same features and specs as the ZMAX Champ. However the Champ does have a larger screen, and more RAM. ZTE is a major electronics company based in China and one of the largest cell phone manufacturers in the world. They usually focus on low-cost devices, especially those targeted at prepaid users, and distribute throughout the world. ZTE's phones generally offer a reasonable mix of features and performance to handle basic smartphone activities, like surfing the web, using a few apps and taking photos, while maintaining a low price tag. In the case of the ZMAX Champ, it features a large touchscreen, but makes sacrifices in other areas to keep the price low. 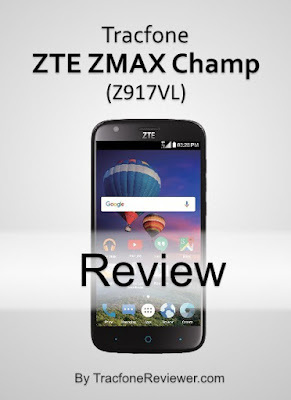 Lets take a closer look in our review for the ZTE ZMAX Champ features. The Champ comes with a 5.5" HD touchscreen that has good viewing angles and brightness. It lacks a little in pixel density, with just 267 dpi, but for most this won't really be noticeable. 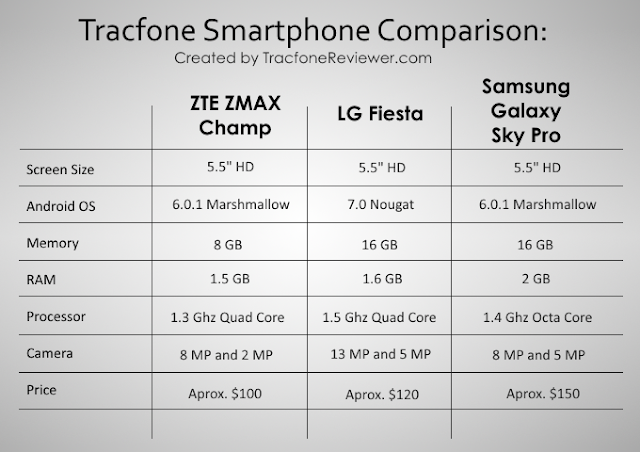 Not everyone prefers a large screen, and Tracfone does offer several other devices with 4.5" or 5" screens. A 5.5" screen is great for easier viewing of photos, videos or text. Although it has a 1.3 Ghz quad core processor, the ZTE Champ cuts corners with just 1.5 GB RAM and 8 GB Memory. Most smartphones, even low cost options, are using closer to 2 GB RAM and 16 GB internal memory. While 1.5 GB RAM is enough for most activities on this phone, users may be limited in multitasking (such as having many different webpages or apps open at once). 8 GB internal memory will limit the number of apps and media users are able to store on this device significantly. A possible upside is that the ZMAX Champ does have a Micro SD Card slot that can be used to store media, and apps (if formatted as internal storage - here is an article with details). The 8 MP rear camera on the Champ is surprisingly decent for a low cost phone. It has flash and auto focus, and can shoot 1080p HD video at 30 fps. The 2 MP selfie camera on the front is nothing special, but adequate for video catting etc. Included with the ZMAX Champ is a 3080 mAh removable battery that gives about 20 hrs talk time and 10 days on standby, although real world use will probably result in slightly lower battery life. A large phone usually results in a larger batter, but a large screen will also drain it faster. The ZMAX Champ strikes a good balance with battery life. The ZTE ZMAX Champ runs Android 6.0.1 which is a relatively new OS. Some Tracfone devices, like the LG Fiesta, come with the newer Android 7.0 OS. One downside to Tracfone smartphones is that they do not receive OS updates, so it is not possible to upgrade to a newer operating system. If this is an important feature for you, consider the BYOP program which allows users to bring unlocked smartphones that can still receive OS updates. The ZMAX Champ includes Triple Minutes which many users will like. This only affects regular airtime cards (60, 120, 200 etc.). In some cases, the new Smartphone only airtime cards are a better deal, especially for texts and data. Visit our Tracfone Airtime Comparison Guide to learn more about which airtime cards are the best deal. The ZTE ZMAX Champ can generally be found for less money compared to the Fiesta and Sky Pro, but those devices boast better storage and performance. As you can see from the table above, the Fiesta has a higher megapixel camera (13 MP) compared to the Sky Pro and Champ. However, the Galaxy Sky Pro has better performance specs, with 2 GB RAM and an Octa Core processor. Last we checked, the LG Fiesta is actually available on Amazon for $99 with airtime bundle and the Samsung Galaxy J7 Sky Pro is also available with airtime bundle for $149. Each of these phones are capable devices, but have certain areas where they are a little better or worse, so take that into account when choosing which to purchase. The ZTE ZMAX Champ is available from several different online retailers as well as in certain retail stores. Also take a look at Cases and Covers for the ZMAX Champ. The ZMAX Champ is also available from HSN for $110 with 1200 talk/text/data. That concludes our review of the ZTE ZMAX Champ. We gather and share the information in this review with the goal of helping our readers make a more informed buying decision. Leave a comment below with any thoughts or questions! For the latest reviews and news, join us on Facebook with more than 2700 followers. We've got lots of other useful articles, including 10 Tips to Boost your Cell Signal and 4 Ways to Check your Tracfone Airtime. If you are new to Tracfone, start with our Beginners Guide which shares lots of helpful info about using Tracfone. And don't forget to check the latest Tracfone Deals and Discounts! 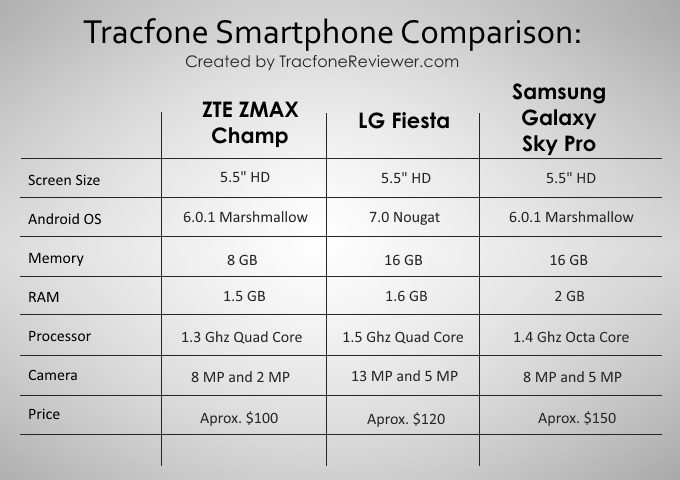 Welcome to TracfoneReviewer, a blog about all things related to Tracfone. Deals updated for October! Looking for a new phone? Or just curious about any good deals? We have collected some great deals and discounts on Tracfone devices here for you! Tracfone sells their phones through a wide variety of methods, including most retail stores like Walmart and Target, and many online retailers such as HSN, Amazon and eBay. You can also buy directly from Tracfone. But how can you find the best prices on a new phone with so many different sellers? Right here! We spend a lot of time checking and monitoring different phones available for Tracfone and the prices, and are sharing some of the best deals on a variety of phones here with our readers. Often the best deals for a new phone are airtime bundles, where you can get a certain amount of airtime along with a new phone. In some cases, the airtime comes preloaded, so be aware of that. Tracfone has made some Changes to Triple Minutes for Life. Follow the link to learn more about these changes, and how it may affect you. Some newer phones offered by Tracfone no longer include triple minutes. We have included some smartphone options that you can bring to Tracfone's BYOP program, which is a great way to choose a smartphone that really fits your needs but continue to use prepaid service from Tracfone. Let's take a look at the deals. Remember that some of these deals go quickly! The LG Fiesta (L64VL) comes with Android 7.0, a 5.5" touchscreen, 16 GB memory and a 1.4 Ghz processor. It is a nice upgrade over many of Tracfone's other smartphone options such as the LG Rebel, and uses CDMA network (Verizon). At $119 including a 1 year/1500 minute airtime bundle on HSN, this is a fantastic deal. The LG Fiesta is also available on Amazon at $139 with 1000 talk minutes, 2000 texts, and 2 GB data. Be sure to read our Review of the LG Fiesta to learn more about the specs and features on this phone. Tracfone is offering the iPhone SE for use on their prepaid CDMA network for just $159 which is a great deal for this device. Visit the Tracfone website, and select 'shop' from the menu and continue to their list of phones to view the iPhone SE. If it is not listed, it could be out of stock or not available in your area. There are unlocked iPhone SE devices available on Amazon, but they are a little more expensive (but are capable of using GSM networks). The Luna Pro is a recently released smartphone that comes with several nice upgrades over the original Galaxy Luna such as a larger screen and more internal memory. You get a 5" touchscreen, Android 6.0,1, 16 GB memory, 1.5 GB RAM and much more. Plus with the deal on HSN you also get 1200 talk/text/data and a year of service (worth $99) for just $99 (now $89). The Luna Pro does not appear to include Triple Minutes for Life. See the deal on HSN. And on QVC for $99 with 1500 minutes bundle. The Galaxy Luna Pro is also available on Amazon for $99 with a $40 airtime bundle that includes 1000 talk, 2000 texts and 2 GB data. For some users, this is actually a better deal! Read our Samsung Galaxy Luna Pro Review to learn more about this phone. For those who are looking for a little more flexibility, and performance, here are a couple great options on unlocked smartphones that can be used with Tracfone BYOP. The E4 from Motorola is a low cost smartphone that still packs a punch when it comes to performance and the latest OS. The E4 features a 5" touchscreen, 2 GB RAM, 16 GB Memory, quad core processor and Android 7.1. It comes unlocked and can be used with either CDMA or GSM networks. While just a little more expensive than some of the Tracfone smartphones, it is a step above in terms of performance, but still geared towards moderate cell phone users who want to run a handful of apps. It is currently available from Amazon for $129 but Prime members can get it at a discount. If you are looking for daily demands including a variety of apps and games, the Moto G5 Plus is a great option. It has a 5" touchscreen, 32 or 64 GB Memory, 2 or 4 GB RAM, an octa core processor, and Android 7.1. Learn more about this phone, including how to bring it to Tracfone BYOP, in our Moto G5 Plus Specs and Info post. The G5 Plus is available for $219 from BHphotovideo or also available from Amazon (at a discount for Prime members). That concludes the deals for this month, we hope these give you some options and ideas if you're shopping for a new phone. Leave a comment below with any great deals we missed, or if you have questions. Join us on Facebook for the latest news and posts, and feel free to ask questions to our helpful community, or message us directly. See the latest Tracfone Cell Phones in our recently updated list. And if you have ever had problems with signal strength and dropped calls, take a look at the 10 Tips for Improving your Cell Signal. 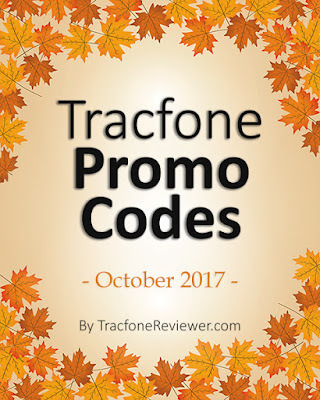 Welcome to TracfoneReviewer, with news, reviews, and monthly promo code list! 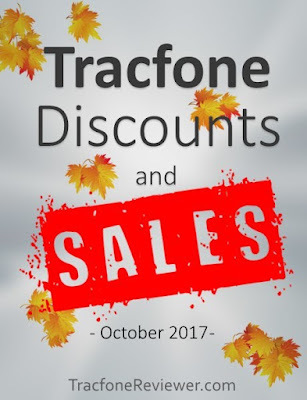 The leaves are changing, the weather is cooling, and we've got new Tracfone promo codes for October! Each month we share new Tracfone promo codes to get free airtime when adding a Tracfone airtime card. These bonus codes can be used by anyone, simply find the code code for the airtime card you are adding, and include it in the promo code area. There are promo codes for both regular airtime cards and smartphone only cards. Each code is usually for a specific airtime card, but may also be used with cards of greater value. We also have a larger list of codes with many more options on our main Tracfone promo code page. The codes listed here are the latest and have been tested for October 2017. Tracfone offers these codes through a variety of outlets, and we collect and share them here for our readers. Be aware that Tracfone doesn't always offers codes for every airtime card, and some codes may only work once, or are for certain phones. If you're unsure what Tracfone airtime card to purchase, take a look at our recent post on the Best Deal for Tracfone Minutes which shares several options depending n your situation. Let's take a look at the new codes. These are the latest codes for Tracfone. We hope you find a bonus code that works for you! Let us know in the comments which code you used and how it worked. Check out the latest Tracfone Deals and Discounts for lowest prices on new smartphones. And if you're shopping for a new phone, be sure to visit our Cell Phone Reviews page and the list of Latest Tracfone Cell Phones 2017. Finally, don't miss out on our community of over 2600 on Facebook where we often post deals, news and other information, plus help answer questions.